LOS ANGELES, April 11, 2019 /PRNewswire/ -- Sunday Goods, the sun-grown cannabis company committed to creating tailored experiences for the modern cannabis consumer, announces the debut of its effect-based pen line. Beginning today, the custom-designed pens will be available at select dispensaries across California. In four effects - Delight, Spark, Soothe and Rest - the pens deliver a specially formulated balance of cannabis, natural terpenes and aromatherapy to create a singular experience around a desired effect. "Sunday Goods is committed to helping people feel good with an experience that's just right for them," said Sunday Goods CEO Randy Smith. "This was the driving force behind the creation of our brand new effect-based pens. They are tailored to complement and improve your everyday life." Delight (THC:CBD - 10:1) - the ideal companion for happy hours. A spicy vanilla aromatherapy and a high THC:CBD ratio provide happiness, mood enhancement, relaxation and calming effects. Spark (THC:CBD - 1:3) - the burst of energy and a sharp focus to spark your day. Stimulating grapefruit aromatherapy ignites creative juices and promotes calm while a high CBD ratio offers extra focus. Soothe (THC:CBD - 1:1) - the relief from minor aches and pains so you can ease what ails you. Peppermint aromatherapy calms the body and mind, while chamomile brings serenity. Rest (THC:CBD:CBN - 10:5:1) - the relaxing and recharging relief when you need to take the edge off. Lavender aromatherapy adds an extra layer of natural tranquility for downtime. 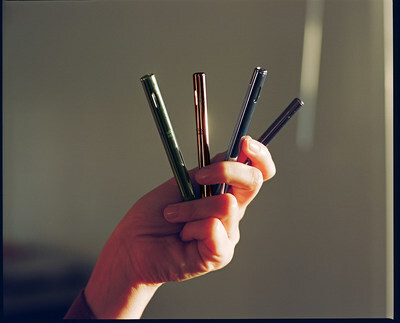 Exclusively designed by Gin Lane, the pens were engineered with an elliptical shape and smooth metal finish. Modern and minimalist in design, the pens were artfully crafted to complement everyday life - whether enjoyed at a dinner party, during a hike or to unwind at the end of the day. Powered by a 300 mAh Li-on battery, each pen is breath activated with a colored LED light that flashes when the user has reached the automatic shut off time. The pens were designed with a medical grade coil and wick, held together by precision interference so that the components fit together without the need for adhesive, removing the risk of toxic chemical inhalation. The launch comes on the heels of the brand's expansion into Northern California where it is now available in more than ten dispensaries as it further integrates into the Bay Area market. The pens are the latest example of Sunday Goods' commitment to quality and integrity stemming from its experience operating "The Pharm," a 320,000-square-foot Dutch glass greenhouse, one of the largest of its kind in the country. As the largest cultivator and purveyor of high quality sun-grown cannabis in the state of Arizona, The Pharm serves as Sunday Goods' lab for continuous improvement through research and development. Here, Sunday Goods combines cultivation expertise and innovation with large scale production, all while maintaining the highest quality, which uniquely sets them apart as leaders in the industry. For more information on Sunday Goods, please visit www.sundaygoods.com and follow along on Instagram and Facebook. Sunday Goods, named one of Entrepreneur Magazine's 100 Cannabis Leaders in 2018, is the largest cultivator and purveyor of high quality sun-grown cannabis in the state of Arizona. Sunday Goods was created with the intention of helping people Feel Good™ by finding a cannabis experience that's just right for them. With high quality products spanning flower, edibles, pre-rolls, topicals, oils and effects-based pens, Sunday Goods uses all-natural methods to respect and preserve the qualities of the original plant. The Sunday Goods commitment to precise consistency delivers products that put the consumers' needs above all. Sunday Goods has developed a collection of products that respect the unique relationships between cannabis and the individual. Sunday Goods is available at select dispensaries in Southern and Northern California as well as Arizona. To learn more, visit www.sundaygoods.com.